C&M Conveyor’s Mesh Ball (MBC) Bundle Conveyor System is a must for load-forming operations, allowing box plants to achieve transfer rates in excess of 20 bundles per minute. This innovative transfer device utilizes the durable Modular Ball-Belt technology to give you the ability to side-shift, right-angle transfer in one or two directions, rotate, and load build on the device in a smaller footprint. It will improve your efficiency at the load former by grouping bundles together, side-by-side, rotating orientation and reducing operator interface. Lateral product movement is achieved by utilizing internally mounted powered belts, which ride under and drive the balls in the Modular Ball-Belt. 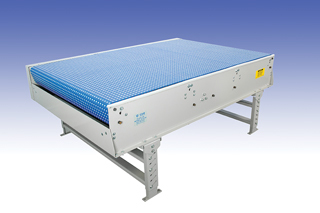 Designed to transfer single bundles or accumulate and transfer multiple bundles. With fewer moving parts and no pneumatics, your bundle-building operations will benefit from the low maintenance and high uptime.